If you’re searching for a great pair of budget earbuds, Skullcandy is one of the best brands in the biz. But how do you choose the best Skullcandy earbuds? Our helpful buying guide will help you answer all the questions you may have about buying Skullcandy earbuds. Everything from “What's the best Skullcandy earbud?” to “which Skullcandy earbuds have the best bass?” Our guide will make it easy and quick to find Skull Candies that are great for you. Bluetooth: Bluetooth connectivity is emerging as a great way to keep your headphones and your devices separate. This is especially useful for anyone who uses their earbuds primarily for working out. Color Options: If there’s one thing Skullcandy is known for, its creating unique and standout designs that allow everyone to find something that they love. Choose a color that really stands out to you. Remote + Mic: A remote and inline mic can help you get everything done hands-free while you’re out and about. Consider getting this if you’ll use your headphones a lot for working out. Connectivity: If you want something that can fit easily with many devices, a wired pair may be the way to go. If you do, however, want to use a wireless pair they can be incredibly convenient. Moisture Resistant: If you’re going to use your headphones primarily for working out, you should choose a pair that is moisture resistant. This makes them less stressful for you to wear in high-impact situations. Warranty: All Skullcandy earbuds come with a two-year warranty, but some of them come with a lifetime warranty. This makes any pair of Skullcandy earbuds a great choice. So now that you know what to look for in Skullcandy earbuds review, we can get right to all our favorite earbuds. We’ve assembled a great Skullcandy earbud buying guide. Our top and budget picks are the best choices for anyone looking for something that is incredible. We’ve also included eight other awesome earbuds so you can be sure that you’re getting a great pair of earbuds. If you’re wondering, “What are the best Skullcandy earbuds?” Our top pick is the one for you. These earbuds are the perfect choice for people who use their headphones all the time. These earbuds are specifically made to stay in your ears during high-impact sports, so they’re a perfect pick for anyone who needs something that can stand up to sweat or just your busy everyday life. They come in seven colors, so you’re sure to find something that speaks to you. They are wired earbuds, so they should fit with many of your accessories. The sweat-resistant components have been sonically welded to block out moisture, so you won't have to worry about your workout damaging your headphones. These buds are made with Supreme Sound technology which means they produce attacking, powerful bass; warm, natural vocals; and precision highs. These buds also have Sticky Gels technology which is 30% more secure when sweating. This helps boosts in-ear stability. Our budget pick is one of the best cheap Skullcandy earbuds on the market. These buds are perfect for anyone on a budget who needs something easy to wear that is great on a budget. These buds provide enhanced bass that provides dynamic range and deep bass. These earbuds are noise-isolating, so you’ll only hear what you want to. 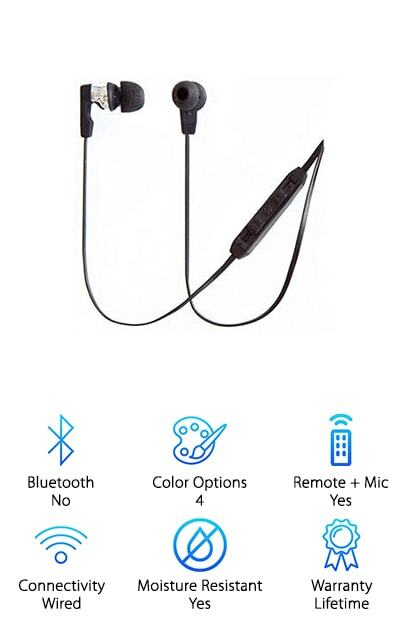 These earbuds are a great choice for anyone looking for something lightweight and comfortable to wear on a daily basis. They have a comfortable in-ear fit. This is great for any occasion- listening to music, audiobooks, or watching movies on a flight. 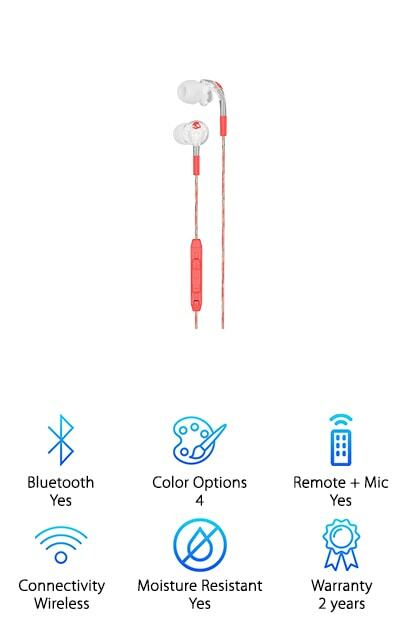 These buds are a perfect choice for anyone who wants to be sure they’re getting a great pair of budget earbuds that can go with them anywhere. There are ten color options available, so you’re sure to find something that speaks to your style. They come with a convenient 1.5-meter cord that allows you to easily connect anywhere. 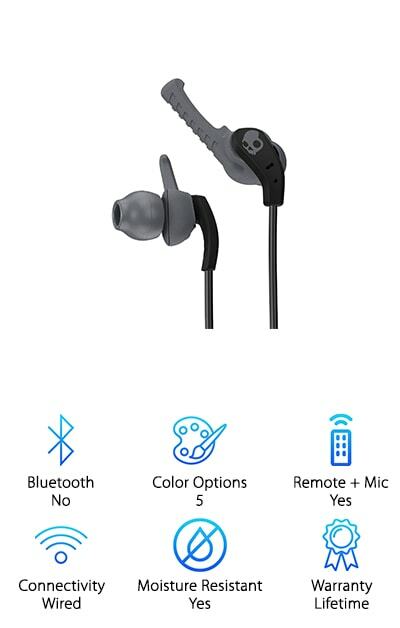 These earbuds are also a great choice for anyone looking for the best Skullcandy earbuds I can buy. These buds provide supreme sound that produces attacking, powerful bass, warm, natural vocals, and precision highs. This makes them a perfect accessory for anyone looking for a superior pair of earbuds that can really produce great sounds on the go. These buds come with an ultra-durable flat cable. This decreases tangles and provides a unique look that is built to last. This means these buds will always be right there when you need them. This pair of headphones also comes with a single button in-line remote with a mic that can take and make calls. This button can also play and pause music and cycle through tracks. This makes these buds a great choice for anyone looking for something with an in-line control. These buds come in seven color options so you can find something that really fits your style. Still wondering “Which Skullcandy earbuds are the best?” may these Strum earbuds will do the trick. These buds come in four colors that are sure to impress anyone. These buds feature ergonomic design qualities to make them the perfect headphones for all-day wear. This includes Tri-Fit Tech, which means these buds use a flexible, angled, oval and hook shape. This allows them to adjust to the unique shape of your ear for the perfect fit every time. This also allows them to provide supreme sound. These buds provide clear and premium audio for every playlist. This makes it easy to listen to all of your favorite playlists without ever losing sound quality. These buds also include a remote that allows you to take calls, adjust the volume and manage your music on virtually any smart device. These buds also come with a lifetime warranty, making them the perfect choice for anyone looking for something that will last them. If you’re looking for some of the best quality Skullcandy earbuds for working out, these may be for you. They come with a useful locking mechanism that helps these earbuds stay in your ear. This makes it easy to focus on your workout, not on keeping your earbuds in. This is a great choice for anyone looking for earbuds that are made specifically for working out. They come in five awesome color options to allow you to get a pair that really matches your style. The color options available are- black/gray, blue/black, plum/pink, black/swirl, and teal/green. This makes it easy for anyone to find a pair of earbuds that really matches their style. These earbuds are sweat resistant and come with comfortable ambient ear gels. They also include a universal mic/remote so so you focus on working out and still control your music with the click of a button. 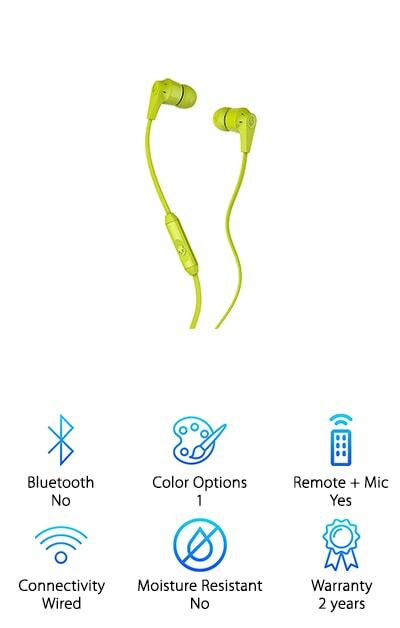 These earbuds are a great pick for anyone looking for the best Skullcandy candy earbuds with mic. 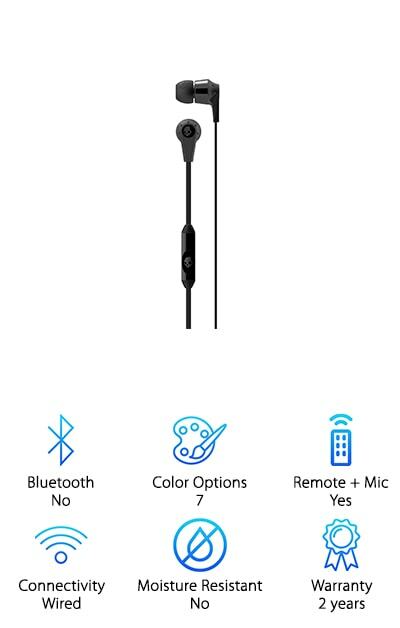 These earbuds come with a mic that is built right into the wire of the headphones for easy access no matter what you are doing. They come in four colors so you’re sure to find something that speaks to you. The colors available are- floral/burgundy, geo black, clear/coral, smoked purple/robin's egg blue. 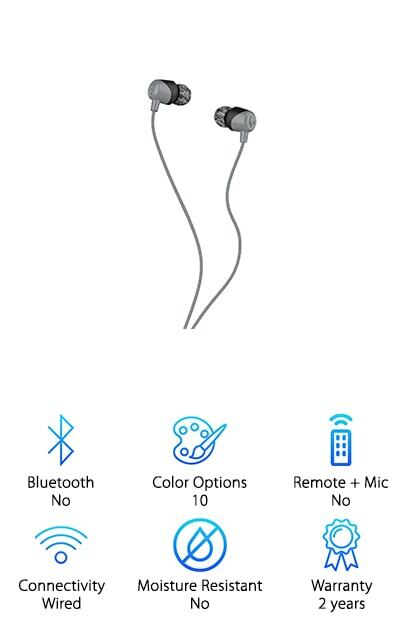 This makes it easy for anyone to find great earbuds. These are also a great choice for anyone looking for Skullcandy earbuds with good bass. These headphones have a great sound and will sound great no matter what you play with them. They come with an antimicrobial finish that protects your buds from picking up germs while you’re on the go. This keeps you and your ears safe. They also come with a clasp case that makes them easy to store when you’re not using them. These are another great choice for anyone looking for the best Skullcandy earbuds for bass. These buds provide great sound for anyone looking for something to take to the gym or just to stand up to your busy everyday life. They come in five colors that make sure there's something for everyone’s style. The colors available are- black swirl, light grey, black/mint swirl, grey/red swirl, and navy. This makes it easy for you to find a color that works well for you. These are the perfect low profile and lightweight earbud for anyone that needs something that delivers 6 hours of your motivational soundtrack nonstop. The Bluetooth functionality doesn’t weigh you down while you’re getting everything done. These buds also come with Pureclean Tech is blended into the ear gels to keep your gear feeling and smelling fresh. This makes putting on your workout earbuds less of a chore. These are a great choice for anyone looking for a great option in the wired headphones category. These headphones are a great competitor for anyone looking for the best sounding Skullcandy earbuds. They provide comfortable security all day long, allowing you to wear them without worrying about them. They come with light and flexible ear hangers that help create a super-secure fit that's also very comfortable. This makes them perfect for anyone who wants earbuds that are extra-secure. These earbuds are made of thoroughly IPX4 sweat-resistant construction. 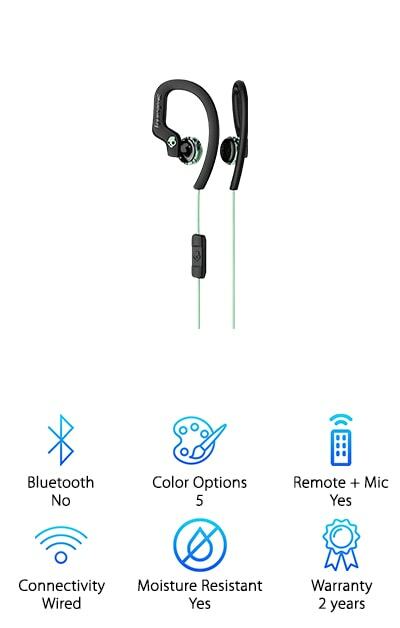 This makes them the perfect choice for anyone who will primarily use their earbuds for working out or for high-impact activities. These buds also come with inline controls that let you control music and take calls with ease. This makes these earbuds the perfect choice for anyone who needs something that can do it all. These are the perfect accessory for any gym rat or city slicker. These earbuds are great for anyone making a Skullcandy andy earbuds comparison. These are a great choice because they are great for anyone who wants to get great sound from a wireless set of headphones. They come in four colors so you can always find something that works for you. The colors options are- black, black/red, white, and blue. 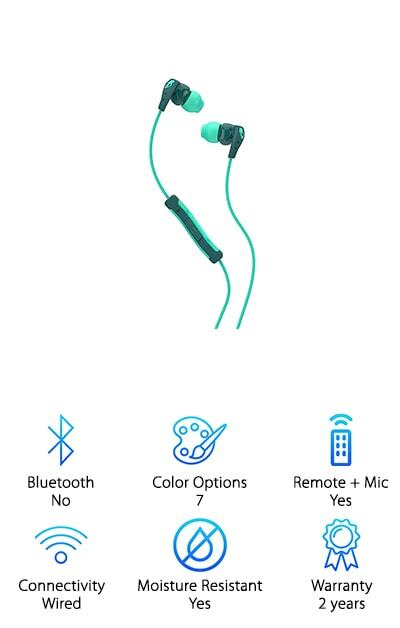 These headphones come with Bluetooth wireless connectivity. It can last for six hours, which means it will keep going for as long as you fo. They also come with a removable flexible collar that can help you keep your headphones on. This makes it a great choice for anyone who wants something sturdy to keep their headphones on when they’re running around the town. They also come with an included mic and remote, which makes it a great choice for anyone who wants something that can easily be controlled. They provide supreme sound quality. Last but not least, some of the best rated Skullcandy earbuds out there. These awesome earbuds are a great pick for anyone who wants a simple and easy set of headphones. They come in a shocking neon green which is sure to stand out no matter where you are. These headphones are a great choice for anyone who wants something that will last a long time. 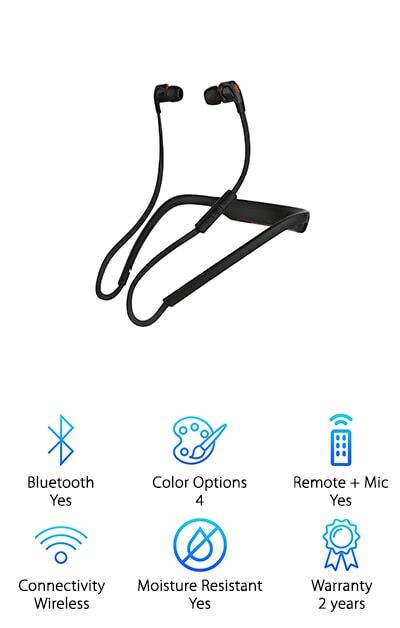 These headphones are also specifically designed so that you can always untangle your headphones easily no matter how far into your bag they are. They come with some interchangeable earbuds so that you can easily fit these headphones into your ears confidently. 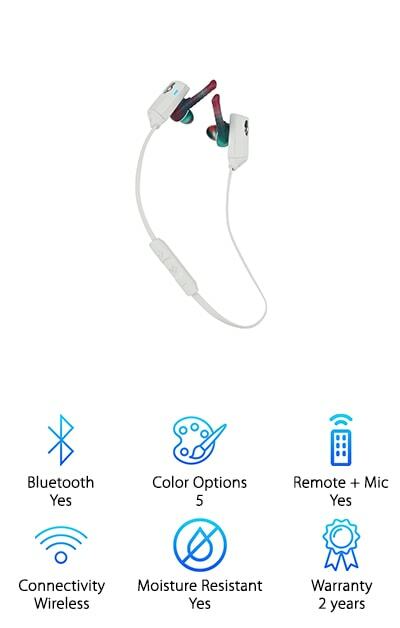 These headphones are a great pick for anyone who wants something that is simple and easy to use. These headphones have an improved design so that they will be incredibly durable and easy to use. This makes them some of the best simple headphones around.